In 2013, former Formula One Champion Michael Schumacher fell while skiing and suffered a traumatic brain injury even though he was wearing a helmet. The culprit? Some sources blame his helmet-mounted GoPro. Although fears that the camera were later allayed, some skiiers are still thinking twice about mounting devices in such a manner. Now, a company called Sweet Protection has designed the first snow helmet capable of protecting you from your action camera. Think about it for a second. Attaching a small, strong, sharp-sided implement securely to your helmet creates two problems: 1) it means you're almost certain to fall onto something hard and protruding in any significant crash and 2) the strength of its mount and its pokey-outy nature basically attaches a lever which will apply rotational torque to your head and neck if it catches on something or jams in the snow. Both are bad. Because wearers require their helmets to be as light and slim as possible, they just haven't been designed to specifically account for the potential problems created by action cameras. Fall and hit a rock, sure. But fall and hit a rock with a small, strong block of plastic in the way and that's a whole other type of impact. Cameras create more potential for penetration and more rotational forces. Enter this new $450 (£301) Sweet Grimnir. 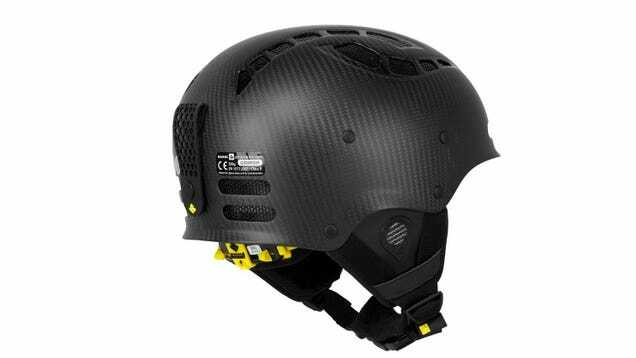 The snow helmet's carbon fibre-reinforced plastic shell is made stronger behind two dedicated mounting points: one on the forehead for a GoPro and one on the side for a Contour or similar. That prevents the cameras from being rammed through the shell, but the problem with additional rotational forces remains. To address that, Sweet has designed built-in mounting points that screw into the helmet's shell. That makes them much more easily removable than the press-on pads that most people use now and, removing both the cameras and the mounts eliminates protrusions that may "grab" during a fall and twist your head, brain and neck. To be clear, that danger remains while the camera or its mount is attached to the helmet. At 600 grams, the Grimnir remains very light, but is around 100 grams heavier than equivalent helmets without the reinforcement or mount threads. The helmet meets both the EN 1077 and ASTM 2040 safety standards. Additionally, Grimnir is fitted with the MIPS anti-rotation technology and, by varying the direction and weave patterns of the carbon fibers in the polymer shell, Sweet says it's been able to take out weight while providing impact absorption tailored to the shapes and strengths of the human skull. You know, so your next holiday video won't include footage of you going into a coma.